After only 4 major quakes all March we have suddenly had two in two days, this morning a mag 6.6 - 78km NNE of Ust'-Kamchatka Staryy, Russia, yesterday we had a magnitude 6.1 - 66km West of Attu Island, Alaska, Sunday we had Russia's Kambalny volcano erupting after being dormant for more than 250 years and on Saturday Cleveland Volcano in Alaska's Aleutian Islands woke up alongside the Bogoslof volcano also on Aleutian Islands, below, massive Coronal hole facing Earth. 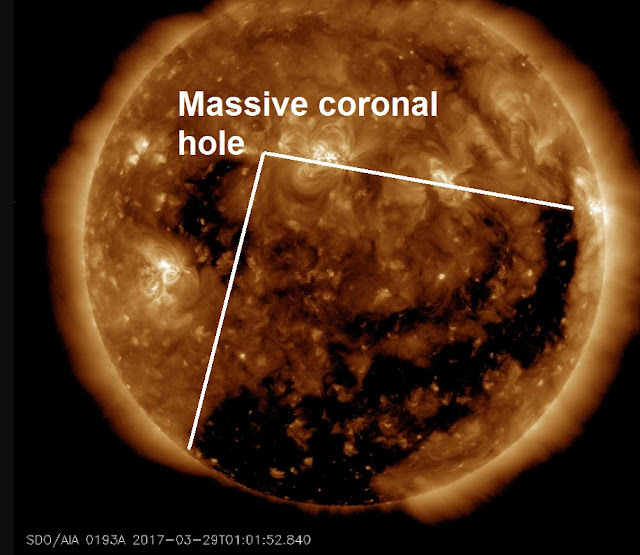 The gaseous material (solar wind) escaping the enormous hole is pressing against Earth's magnetic field with speeds exceeding 700 km/second. At the moment, the solar wind shows no signs of flagging. Speeds between 650 and 750 km/s are likely for the rest of March 29th with a 25% chance of G1-class geomagnetic storms, see below.